Join award-winning environmental documentarian Bridget Besaw, in collaboration with Leica Camera for a weeklong course documenting the preservation and stewardship of the Aysén region of Patagonia. Throughout the week, Bridget will teach you documentary and travel photography techniques. Each day, you’ll put your knowledge to practice in the field, as you capture all aspects of the story of Patagonia conservation in breathtaking quality with top-flight equipment loaned by Leica Camera. Your final result will be a portfolio that includes stunning imagery of the vast, pristine wilderness region, one of the last of its kind in the world. This workshop is part of a larger offering of Seedlight Workshops Climate Change Photo Workshop series. Although Chile is a low carbon emitter, responsible for only 0.24% of total global emissions, it is nonetheless vulnerable to the adverse effects of climate change. Changes in temperature, glacial retreat, shifts in rainfall patterns, drought, expanding deserts will all impact the interplay between Chile’s economic development and natural environment including: water availability, food security, land use, land-use change and forestry. Bridget’s work visually illustrates ecological issues in Patagonia, making powerful statements that help us steward the environment. Capture the outdoor adventure aspect of wild-land preservation while horseback riding, hiking, river floating, mountain biking, bird watching, and fishing. Cultural coverage of the foundation’s community projects in traditional arts, sustainable ranching, and organic agriculture initiatives. Conservation through the lens of science as we visit the Patagonia Sur reforestation and climate change research sites. This workshop is designed for both professional and amateur photographers with an interest in travel photography as well as environmental issues. Also, if a friend, spouse, or partner would like to accompany you, and they are not interested in participating in the photography workshop, they may instead avail themselves of the range and depth of professionally guided outdoor activities the Patagonia Sur Reserves has to offer, including fly fishing, hiking, horseback riding, kayaking, river rafting, flora and fauna expeditions, and mountain biking. 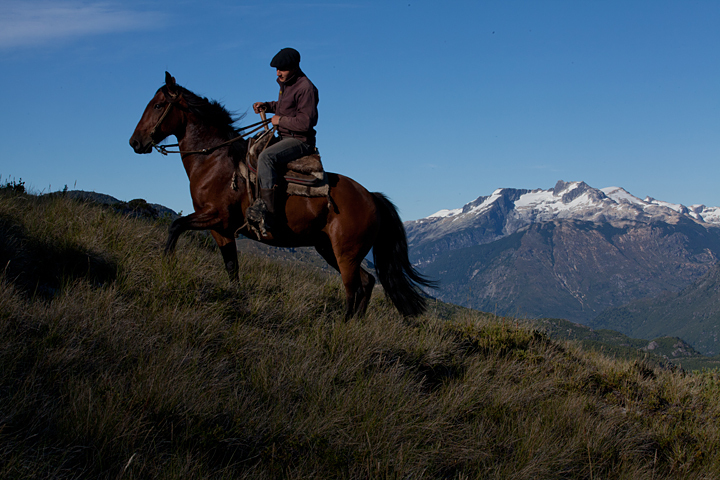 Patagonia Sur’s Valle California and Melimoyu sites will serve as home base for participants. Please click here to view photos of accommodations and amenities for Valle California’s La Estrella Ranch and Melimoyu’s Casa Bahía. From these inspiring settings, workshop participants learn documentary field techniques and put them into practice while creating a portfolio of imagery that tells the important story of the conservation of this vast, pristine, wilderness region—one of the last of its kind in the world. The end result is a portfolio of imagery that participants can be proud of on a multitude of levels. *(Please note: If you are traveling unaccompanied and would like the double occupancy rate of $7,725, we will pair you with a same gender workshop participant roommate. If you would prefer private accommodations, the rate for single occupancy is $9,825). How this unique visual storytelling approach plays a vital role in conservation efforts. Project research, planning and shoot preparation. Preserving Wilderness Adventure OR Discovering Serenity in Nature. Tell the story of how people are enriched by this beautiful place while horseback riding, river floating, fly-fishing, mountain biking, kayaking, or hiking in the Patagonia Sur Nature Reserve. Understanding the science behind conservation so you can photograph it well. Learn how compelling images of science-in-action encourage people to invest in nature. Tour the Patagonia Sur Valle California Reforestation & Biodiversity research site to photograph a healing relationship between science and nature. We illustrate the story of how trees planted in Patagonia will benefit generations to come all around the planet. Why imagery of the human relationship to protected places is vital to sustainable conservation. Afternoon photo assignments: Sustainable Agriculture, Traditional Arts or Conservation Education. Spend the day photographing activities in the nearby village of Palena where the Patagonia Sur Foundation is working with residents to support conservation initiatives and promote economic and social development. For questions or more information, please email Reservations@PatagoniaSur.com. Bridget Besaw tells the story of the human connection to the natural world. The primary inspiration for her work is environmental protection. As a newspaper and magazine photographer Bridget won numerous national press awards for environmental stories for magazines such as Newsweek, Time, Forbes, Fortune, The New York Times, Business Week, Smithsonian, National Geographic Adventure, and Nature Conservancy Magazine. Bridget now produces imagery, multimedia, exhibits and books as outreach tools for environmental organizations and teaches photography workshops on how to do the same. Bridget’s projects have tackled issues such as development threats to northern Maine’s wilderness, loss of working farmland in New England, restoration of crucial salmon habitat in the North Pacific, threats to wild rivers and arid grasslands in South America, climate change research and prevention in South American and Indonesian forests and sustainable fisheries initiatives throughout the world. Bridget has published two books in partnership with environmental organizations: Wildness within, Wildness without and From the Land.